The monthly pill organizer for your daily medications. Now users and caregivers will have an easy way to track and manage one of the most important components of effective health care. 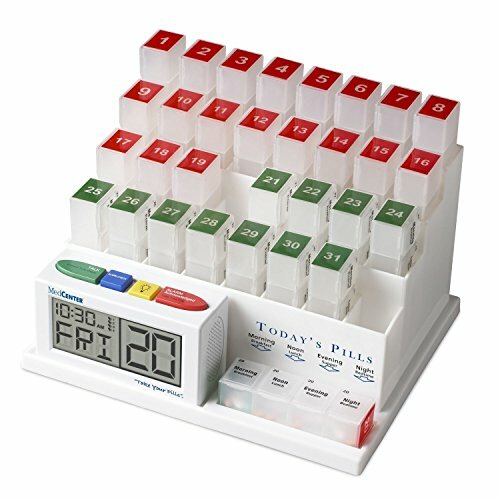 Organizes pills for 31 days of medication. Red and green color coded pill boxes quickly show when the daily dose is complete. Emphasizing the date throughout the organizer reassures medication compliance. 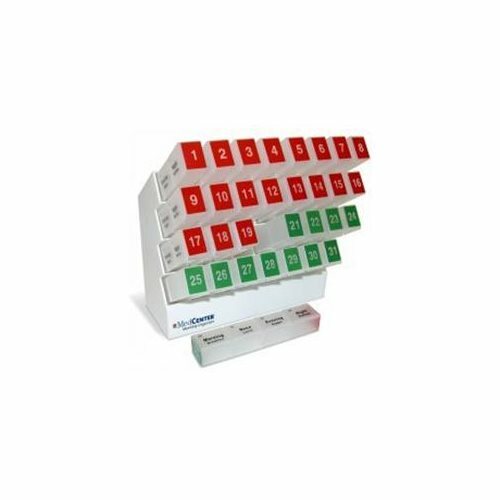 Dimensions: 10""W x 7-1/4""H x 7-1/4""D.
31 Four Cavity Pill Cassettes. 4 Compartments in each pill cassette (holds up to 60 pills for each day's dosages). Numbered pill corresponds to each day of the month cassettes. Talking Alarm alerts users when it's time to take their medication. Alarm sounds periodically until special 'alarm acknowledged' button is pressed. Large-Type Display makes viewing the date day and time easy. Up to 4 Daily Alarms (Morning Afternoon Evening Night). Preset with Default Alarm Times (morning: 7: 00 a.
Backlit display for convenient night time viewing. 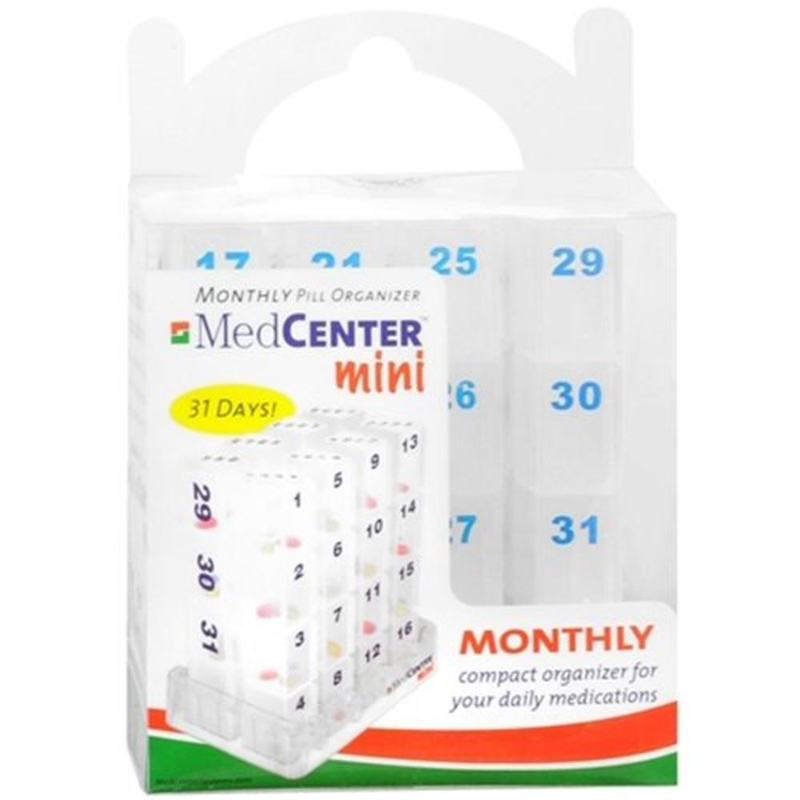 Dimensions: 10""W x 7-1/4""H x 8""D.
MedCenter's 31-Day Mini-Pill Organizer is designed for people taking a few medications per day. It improves your medication adherence, which improves health. This petite pill minder organizes your pills for an entire month. Each of the included 8 pill boxes contains 4 numerically marked compartments for each day of the month. This gives you a total of 31 daily compartments in a compact monthly organizer. Mini pill organizer for an entire month 8 Pill boxes - each with 4 numerically marked compartments for each day of the month 31 Daily compartments Clear 5-3/4""W x 6""H x 3-3/4""D Weight: 12 oz Care instructions: Wipe with damp cloth. 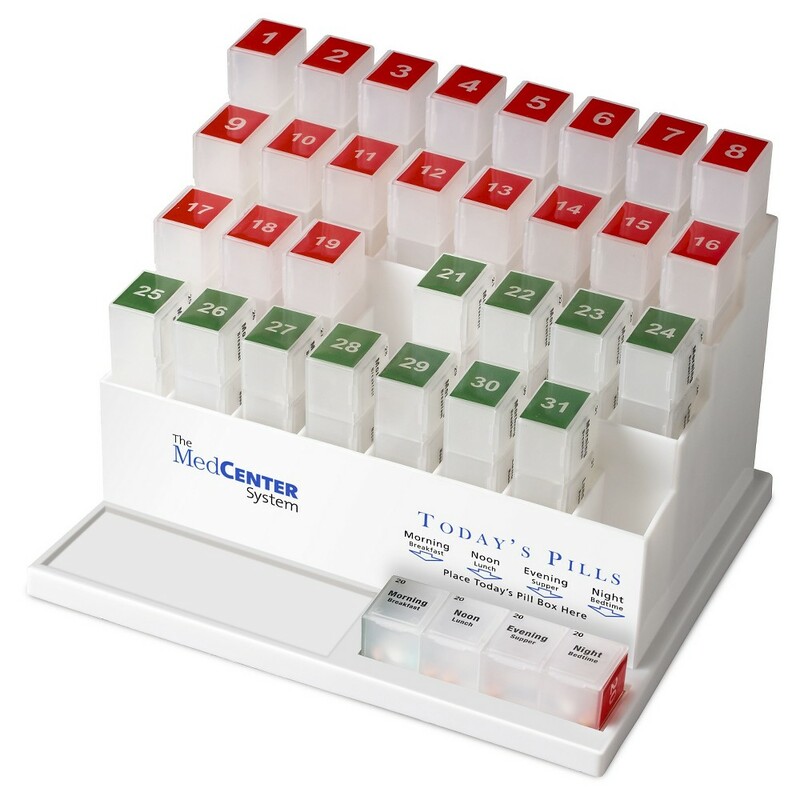 The Dual MedCenter System features 31 Daily Pill Cassettes, MedCenter Pill Stand, Talking MedCenter Alarm Clock, Empty Travel Box, additional MedCenter Pill Stand and additional 31 Daily Pill Cassettes. 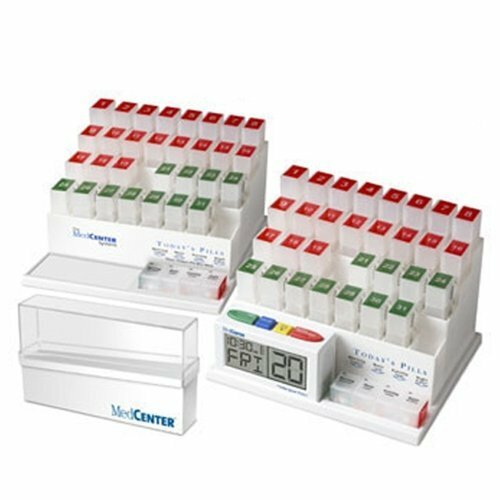 The Dual MedCenter System allows you to keep a spare Pill Organizer so your care provider or Pharmacist can fill and prepare without disturbing your working system. The additional Travel Box allows for added convenience when you are on the go. - TRI-DATE VERIFICATION: matching the visual dates on pill boxes and clock with audible alerts assures accuracy - TALKING ALARM alerts users when it's time to take medication - Set up to 4 ALARMS DAILY to alert you when your medication is due - LOUD & EXTRA LOUD sound settings ensure the alarm is heard - RED & GREEN COLOR CODING shows when daily dose is complete . MedCenter's 31-Day Vitamin Organizer reminds you to take your vitamins every day. Now, you can manage all your vitamins on a monthly basis, eliminating all those unsightly vitamin bottles. You can easily remember to keep yourself healthy with this pill minder for your vitamins. 31-Day vitamin organizer White 6""W x 10""H x 9-1/2""D Weight: 3lb 6oz Care instructions: Wipe with damp cloth.